This year, I had the wonderful opportunity to co-organize the Social Media Business Summit track (the largest track at BlogWorld) with my friend and colleague, Chuck Hemann. We started planning the track in July by identifying sessions we thought would resonate with folks and started finding speakers who could speak to those topics (with the help of a great “editorial board”). Three months later, we were on the ground in Vegas executing on our “vision” for the event. From everything I heard at BlogWorld, it was a success. But, along the way, I picked up a few best practices and learned a few valuable lessons when it comes to planning an event the size and stature of BlogWorld. To be clear, Chuck and I weren’t responsible for all the logistics and details that go into this kind of event—really just the sessions, speakers and details around that. Personality mix can be as important as content. We organized a number of panels for the Summit this year. The first question we asked ourselves when identifying speakers was “who could speak to this topic well?” Important, no question. 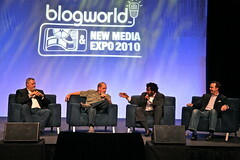 But, as I sat in the sessions at BlogWorld it became clear that personality mix can be just as big of a consideration. So, it probably makes sense to ask yourself: “How will these three people interact on stage?” before nailing down your panelists. You don’t want someone dominating the conversation. As well, you don’t want panelists yelling at each other, either (not that I saw that happen at BlogWorld). Choose your panelists wisely. They don’t have to necessarily get along, but they need to be well-spoken, respectful and open to productive conversation. Make your speaker’s lives as easy as possible. Leading up to the event, we made it a priority to keep our speakers as updated as possible on logistics and details of the event. Hotel reservations. Timing. Even party schedules. Our goal: Make their lives as easy as possible. They are the content that runs your event—make sure they’re happy. Stay on top of the details (even the smallest ones). Obviously, staying on top of details when planning an event is paramount. No huge revelation there. But, the learning for me this week is that the smallest of details can have the biggest impact. For example, in one panel, we found ourselves missing a panelist with about a minute til showtime. We couldn’t find her. Not in the speaker’s room. Not on the show floor. Just couldn’t find her. Wouldn’t a speaker phone tree have come in helpful in that moment? Uh, yeah. Thankfully, the moderator was Johnny-on-the-spot and had her number in his phone from a previous interview with her. But, by that time, I had already learned my lesson. Follow-up is as key as preparation. Sure, preparation before the event is essential. Everyone knows that. But, what a lot of folks forget is that timely follow up AFTER the event can be just as powerful. I’m thinking about your follow up with speakers, vendors, attendees and volunteers. Use your follow up as a chance to reinforce how much you valued their input and help. And, modify your mode of outreach depending on the audience. For example, give the inner circle of folks who helped you pull off the event a personal phone call, thanking them for helping you pull off a successful event. Meanwhile, email might be the best way to follow up with attendees on post-event details and resources and information about next year’s event (if there is one).